Calling all wannabe videomakers!Using your tablet, smartphone, digicam or videocam, create a short video related to the Gospels featured in our CFA magazines. Recognizing the growing popularity of Smartphones and tablets (especially among the young), the Publications Department of the Communications Foundation for Asia has started using QR codes in its magazines. QR (short for Quick Response) codes are matrix barcodes that may be read by an imaging device, such as a Smartphone or tablet with a camera and pre-installed scanning app. The device may then re-direct the user to a Web location (or load a file, or bring up a GPS spot) encoded in the image. 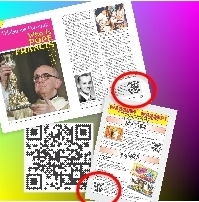 Scanning the QR code on the Pope Francis article shown in the picture, for example, will load for the reader a YouTube video docu on Fr. Jorge Mario Bergoglio. Meanwhile, the QR code on the right-hand page will let the reader sample a new Android game being reviewed in CFA’s Pambata magazine. “We see a wide array of uses for QR codes,” a CFA editor said. “If an article in our magazine is discussing the Miracle in Cana, for instance, a QR code can take the reader to a Google map of Cana—giving the reader a ‘you-are-there’ experience. We always look for ways by which our readers can better understand and appreciate our magazines, beyond what they see in print.” CFA is trying out the use of QR codes in its magazines for intermediate- and high school readers, realizing these are the levels where Smartphones and tablets are likely in heavy use. In line with Communication Foundation for Asia’s goal of reaching out to its magazine subscribers through the social media, CFA recently launch its own Facebook and Twitter account. You can now easily communicate with our sales and publications team via such networks. Feel free to post your comments, suggestions and stories.